AmpliTalk 200 is a new and improved adaptation of the world-renowned Vocally. AmpliTalk 200 is a landline phone that enables you to speak the name of a contact and the phone will dial the number and call automatically. AmpliTalk 200 does not only enable you to store up to 45 contacts, but also allows you to speak the digits of phone numbers that you want to dial! Tens of thousands of units of the Vocally have been sold worldwide, and the AmpliTalk 200 is its highly awaited successor among the visually impaired, people with limited mobility, and the elderly. 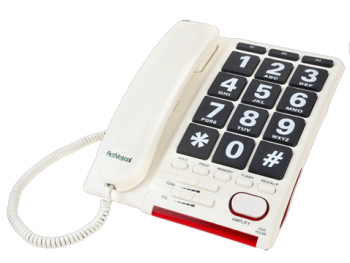 This phone, with a classic, neutral design and extra large digit keys, simplifies life for people with different types of impairment, by allowing any user full communication with a friendly and intuitive device. Available languages: English, Spanish, French, German, Flemish, and Dutch.